skp is an abbreviation for slip, knit, pass slipped stitch over. 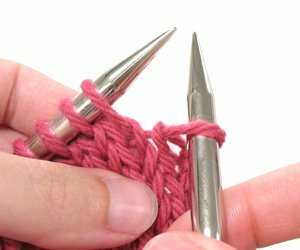 To complete this technique, you must slip one stitch knitwise, knit the next stitch, then pass the slipped stitch over the knit stitch and off of the needle. This is a single decrease and it slants to the left. Here is the slipped stitch. After you’ve slipped the first stitch and knit the next one, you are ready to pass the slipped stitch over. 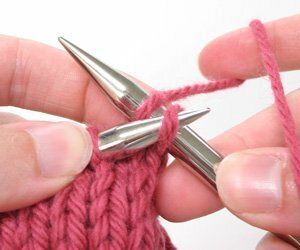 Use your left needle to lift up the slipped stitch as shown in the photo to the right. Pass the lifted stitch over the knit stitch and drop it off of the right needle. 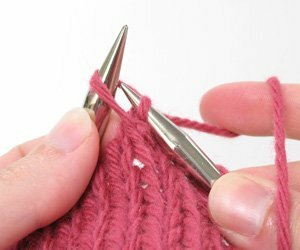 Be careful not to let the knitted stitch drop off of the needle in the process.